One thing that amuses me in the ad above is the caption under the old man: "Hear rock and roll. And music." Because rock and roll is not music...at least, not to the senior set. I love the Panasonic tagline "just slightly ahead of our time"...I suppose if you think about it, they were trying to come up with a way of making music portable, even though Sony would later perfect it with the iconic Walkman player. Did I say one ad too good not to share? 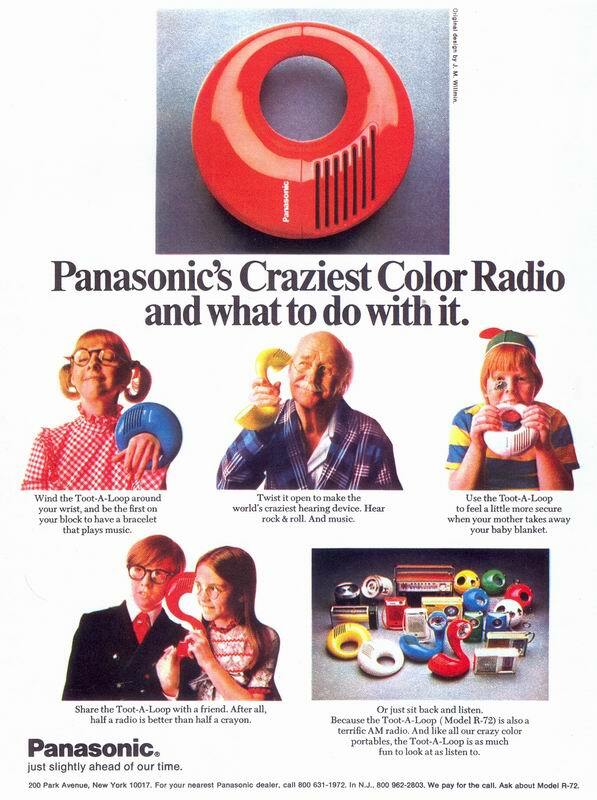 Make that two--I love the colorful collection of products that Panasonic was promoting at the time from the spread below. I think these were also known as "poppies." No doubt many of these are collector's items today, and sure would make for some groovy decor. 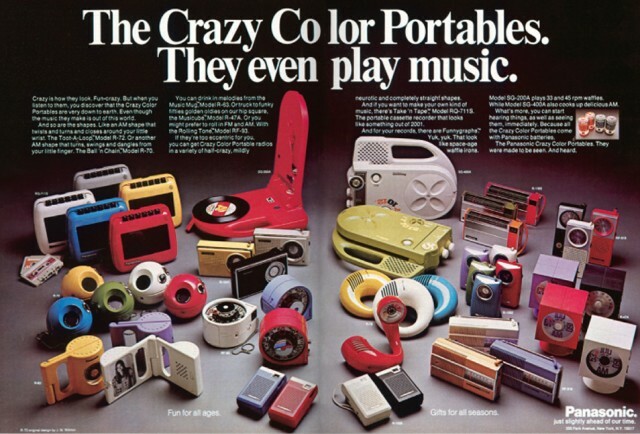 Did you or do you have a Toot-a-Loop radio, or any of these these products? They all look wonderful in the add. Who could choose just one. I LOVE electronics products from that era, having owned many of them, as well as working with the technology at a theoretical and practical level. The thing at that time period was clever design of the package, as well as miniaturization. Panasonic was a technology leader in advanced miniaturized components, likely why they sold such radios on the first place. Even then, radio electronics itself was very mature, decidedly low-tech, and crudely hand-assembled. My favs were a Mickey Mouse and a Champion Spark Plug radio. But especially my battery operated mini phonograph w/AM/FM. All fun until my Crosby, Stills, and Nash LP permanently warped in the sun when I took it outside to listen with my friends! PS I lusted after a gimmicky wrist radio of the time. Those are pretty darn cool. There's no memorabilia quite like 70s memorabilia. We only had a Panasonic tape recorder that amused us greatly. My mum had a gorgeous violet-colored, portable mini transistor radio back then that I adored. I thought they were so cool, and unlike most things I thought were cool back then, I still do! I remember these. I have several transitor radios in fun shapes although not the loop. Storage is now an issue. Thanks for the post. Fantastic post! These devices are just incredibly cool, starting with the Toot-a-Loop radio. The fold-out record player is also great and I would have loved to have had one as a kid. Oh, do I remember the commercials Panasonic did for these radios in the '70's! I wonder if YouTube has any of them up. 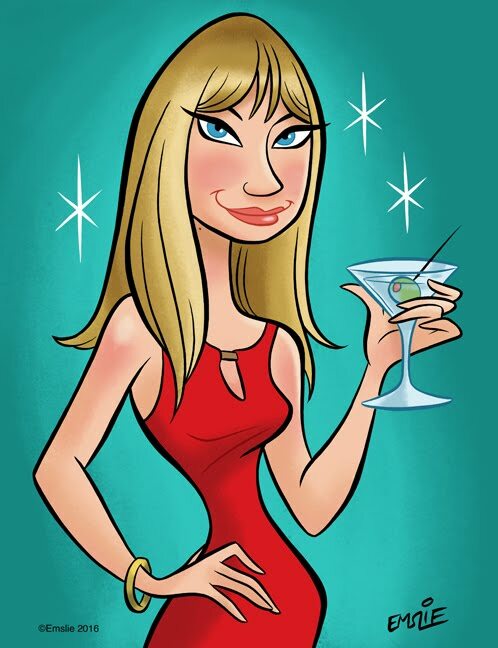 You couldn't get through an episode of The Archies without seeing one. They were defineitly aiming at the teenyboppers with Toot a Loop. OMG I actually had one of these (a white one) back in the day. I had completely forgot about it. That's saying something, what with all the retro blogosphere and all. Thanks for a great find. I had a blue Ball and Chain radio that I loved dearly. I had one that was shaped like one of those big console hi-fi pieces of furniture but was about 6 inches across. The top opened for who knows what reason. The one I was really jonesing for was the cylinder model made of clear blue plastic with the transistors visible inside. Too cool. I had the blue AM radio. These ads must be from 1973 to early 1974. They predate the Dynamite-8 8-track player which came out in late 1974 and I got one for Christmas that year. Does anyone know how I can find a Panasonic commercial from 1971? It was filmed for close circuit tv in there show rooms. It featured Blood Sweat and tears song "what goes up Must Come Down". I lived in Japan then and recorded the song in the studio. They then had a Japanese pop star lip sync while another girl and I lip synced back up vocals in the video. I'd love to get a copy of it. I had a blue toot a loop. I loved it. I was about 10 or 11 when I had mine, early 70s. I loved my red Toot-A-Loop!